In my introductory article, I noted that the idea of smashing Disney and Final Fantasy together was a nutty proposition when Kingdom Hearts was first announced. These were two completely different worlds – western animation and Japanese role-playing games – being brought together seemingly on a whim, with no immediately obvious similarity to marry the two. Somehow, though, it all worked out, a common coming-of-age theme featured in both serving as a nice point of intersection. 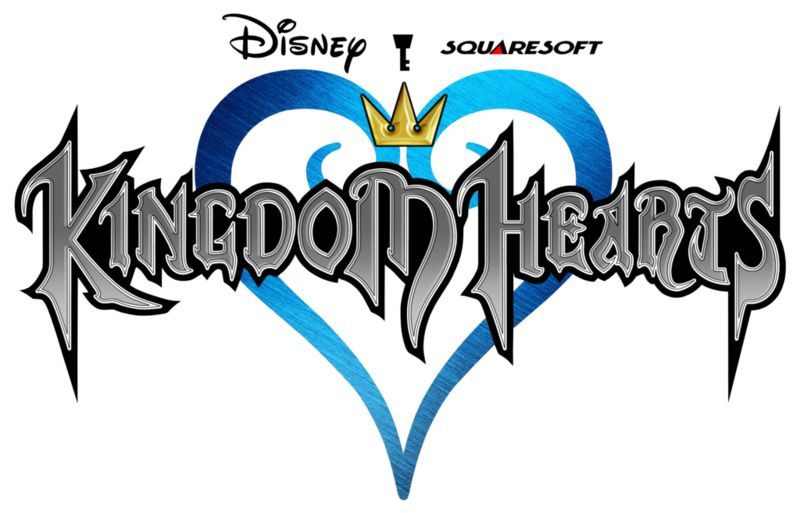 Kingdom Hearts follows the story of Sora, a young boy from the world of Destiny Islands who gets swept up into an adventure across numerous Disney realities. After years spent enjoying his childhood with friends Riku and Kairi, a mysterious figure appears in Sora’s world, bringing with him a dark force known as the Heartless. Though Sora receives a mystical weapon called a Keyblade to fight the Heartless, his home is ultimately destroyed, and he’s left to find his missing friends and figure out how to stop the same thing from happening to other worlds. 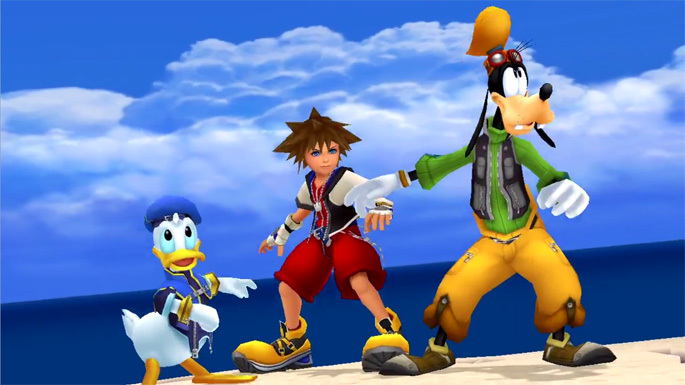 Sora is joined on his journey by classic Disney characters Donald and Goofy, who are on their own mission to locate their missing king, Mickey. Together, the trio bounces around the galaxy in their weirdly polygonal Gummi Ship, visiting Disney worlds based on films like Aladdin and Hercules. Along the way, they face against a cabal of Disney villains led by the evil Ansem, all while learning more and more about the true power of their own hearts. The game’s biggest success is knowing in what ways to draw from each of its disparate worlds. Narratively, Kingdom Hearts leans far more heavily into the Disney end of things, with Final Fantasy characters dominating only a single world and making brief appearances in two others. The series-exclusive characters certainly lean more towards the Square Enix side of things, with their spiky hair and ridiculous outfits, but the game overall speaks to the Disney fan first and foremost. That continues through the game’s graphical style, which does a fantastic job of bringing Disney’s animated classics into the third-dimension long before the House of Mouse figured out how to do it well in their own films. The graphics have gotten an HD facelift, true, but the base models are solid, and each world is bursting with life and dynamic style, even when limited by the PS2’s capabilities. Where the game draws most from Square Enix, not surprisingly, is in its gameplay design. This is where the Final Fantasy elements come through in full force, in everything from the spell names, to the leveling and combat, to all the systems that add depth to the game. And what’s refreshing in the face of recent Square Enix games is how these systems offer complexity, not complication. 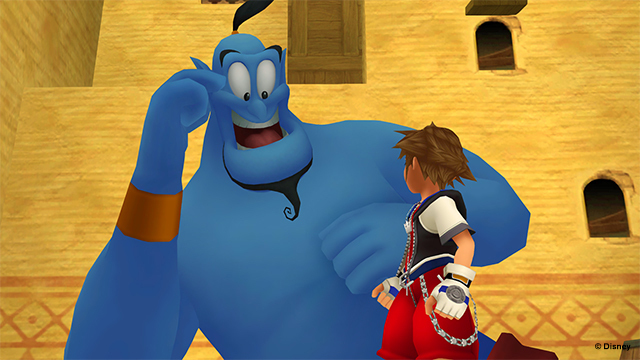 Kingdom Hearts has a more simplified, easy-to-understand system than most RPGs, but it still manages to offer a lot of variety and unique choices. You gain new magic spells throughout the game automatically, with the ability to upgrade them to more potent forms coming through world exploration and side-quests. The Ability Points (AP) system lets you equip a wide variety of skills to Sora, Donald, and Goofy, the majority of which either provide passive boosts or seamlessly introduce new abilities into your repertoire. And while Goofy and Donald serve as solid support as is, a separate submenu allows you to fiddle with exactly how they’ll react to different situations in battle. The bulk of combat is played out with Kingdom Hearts’ straightforward Command Menu. The original game features four options – Attack, Magic, Item, and Summon (separated from Magic in the Final Mix version of the game) – and each of which does exactly what it says, giving you instant access to your various combat options in real time. The limited slots in each of these submenus make it easy to quickly choose your options in the heat of combat, and the system evolves in a satisfying way throughout the game without losing any of that simplicity. Honestly, it’s just refreshing how well the whole package has aged. True, I’m playing a version of the game that’s been tweaked and uprezzed several times over, but the core systems still add up to compelling, fun package. There are definitely some archaic elements – swimming in The Little Mermaid’s Atlantica is awkward, the early worlds suffer from maze-like design, and the game’s tougher bosses and enemies can get too many spammy, overpowered hits in – but the good definitely outweighs the bad. Further, just as the gameplay benefits from simplicity, so, too, does the story. Yes, it’s your basic save the world plot, but it tells it well and features likable, familiar characters. And knowing just how convoluted the story will get as soon as the very next game, it was nice to go back and remember the core coming-of-age tale at the center of things. Sora’s world is in for a lot of upheaval, but this game stands apart, before concepts like Organization XIII, Nobodies, and ludicrous subtitles were introduced into the mix. Put simply, Kingdom Hearts is a PS2 masterpiece, one that manages to stand the test of time, if with a little help from its developer along the way. Ultimately, the core systems at the Heart of it all remain fun, keeping this initial entry in the series an accessible, entertaining time. Here’s hoping the future titles can keep pace and prove just as timeless.